Hello readers! (All 5 of you!) Today I am actually going to follow through with my promise to speak a bit about that dock that washed up in Oregon several weeks ago. News on this has quickly faded, so it's probably good I talk about it now before it completely fades from our short cultural memory. Misawa, Japan, is a small coastal city on the island of Honshu. It hosts a small population of about 43,000, and is primarily home to residents of the Misawa American Military Airbase, established in 1947 by President Truman. It has a temporate, seasonal climate, and is approximately 40 minutes away from the next largest city of Hachinoche. Like other towns in the region, it has local agriculture and has adjusted to the heavy American influence. It is also a port town, where merchant and fishing ships dock on a day-to-day basis. 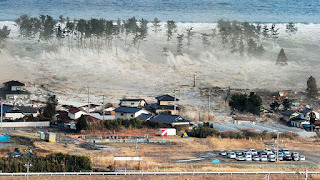 On March 11, 2011, the historic tsunami tore 4 large docks from the port of Misawa. One of them landed nearby, two disappeared, and one began its journey across the ocean. 15 months and 4,900 miles later, it landed just a few miles from where I work and live. In the wee hours of June 5, 2012, the monstrous dock (66 feet long and 165 tons) was found on Agate Beach, in Newport, OR. 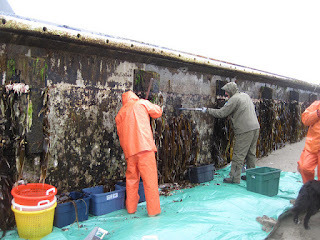 It was covered in marine life that included seaweed, barnacles, mussels, and bivalves. 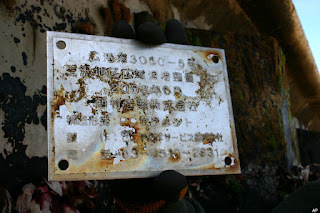 The dock was identified via a plaque secured to it- this was removed and put into storage to prevent vandalism or theft. Being that it was pretty solidly constructed of rebar and concrete, it certainly wasn't going anywhere soon. 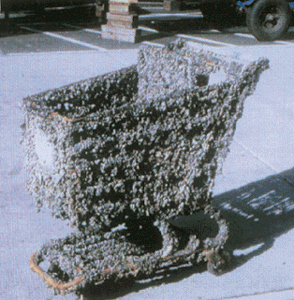 Instead, Oregon Department of Fisheries and Wildlife spearheaded an effort to quickly contain all possible marine invasive species. Two professors at Oregon State University's Hatfield Marine Science Center (Drs. Jessica Miller and John Chapman) headed off the effort to collect and catalog potential invasive specimens, while local volunteers geared up and prepared to clear the dock of organisms until it could be removed. According to a friend and ODFW fellow, a tarp was laid down and the day's hard work began. Volunteers scraped all easily scoured animals and plants from the structure, while ODFW employees used blow torches to burn off any other critters that may have been left in hard-to-reach areas. Lastly, animals were removed as much as possible from the bottom of the dock which was partially submerged. All in all, 2 tons (not the 10 or 100 tons quoted by news sources) was removed from the dock. That's right...4,000 pounds of creatures. Most notably, a few possibly aggressively invasive species were found. The first of which was a much-talked about species of Asian sea star was found clinging to the dock - the Northern Pacific sea star (Asterias amurensis). Globally, sea stars ('starfish' is an incorrect term- sea stars are echinoderms, not fish) are aggressive intertidal predators, which have the ability to actually shape the ecological functioning of their biological communities- this is called a keystone species. Oregon (and much of the west North American coast) has a keystone predator called the purple sea star (Pisaster ochraceus) that is invaluable to intertidal ecosystems. The danger of invasive species is their singular ability to outcompete natural species, causing a shift in the way an ecosystem functions, resulting in an ecosystem that is novel or irreversibly changed. Another potential invasive species that was found on the dock was Wakame seaweed (shown below). 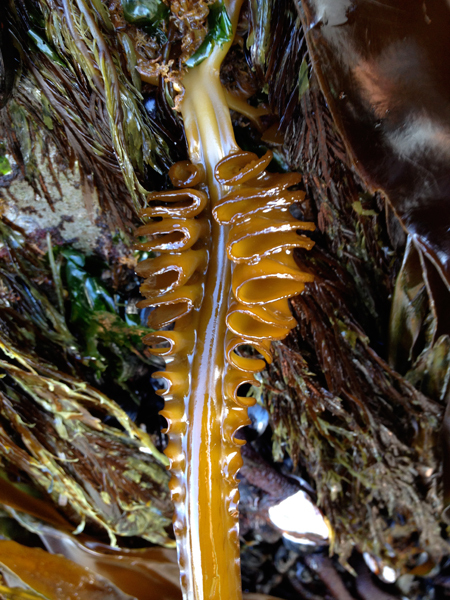 ODFW is requesting that folks ID, report and remove Wakame if they find it on the coast. It is likely that other debris will play host to this algae, and it may emerge as a problem in the future. Frighteningly, Wakame is listed as one of the world's 100 most invasive species outside of its natural habitat. While it is a valuable food source in its native range, it has the ability to quickly outgrow and smother other species of seaweed. This could be dangerous for the hundreds of local seaweeds along the west coast- including Oregon's beautiful and unique kelp forests. For those of us who are local, if you find Wakame seaweed, remove it carefully and in its entirety, and don't put it back on the beach. Take a photo and note the location, then contact 1-866-Invader to make a report. Objects like the dock are going to cost a considerable amount of money in the future, not only through physical removal, but also through the economic costs of invasive species. In fact, the estimate for removal of the dock is listed at $84,000 alone. This should be put in context with the fact that congress recently allotted $50,000 each to Oregon, Alaska, Hawaii, California, and Washington expressly for the removal of marine debris related to the tsunami. So...apparently we already are over budget with one object. Add to that the fact that invasive species cost the United State government an estimated $123 billion dollars a year (according to Scientific American), and we have ourselves a very serious problem. Keep in mind that it is very difficult to estimate the cost of invasives- but estimates range in the millions to billions of dollars, no matter which organization you ask. On the flip side of the coin, it is quite ironic that with trans-oceanic transport, importing, and worldwide travel, this is likely one of the most natural ways in which we could receive non-native species on our shores. Besides economic issues, where do we draw the line between invasive species and natural events? This would be one of those things that us scientists debate over a beer. Apparently, the dock has caused quite a local and regional stir, with a bit of economic boosting for the local economy as people flock in to see it. Creatures or not, it is a unique event the likes of which are unlikely to happen again in our lifetimes. It is also a reminder of the power of nature and entropy on our little blue planet. Amidst all of this, it is easy to lose the perspective that the dislodging of these four docks was caused by a much larger event. The formidable forces of nature that tore these docks into the open sea also claimed more than 16,000 lives. Like much of the debris that will be washing up, this dock tells a story not only of the ocean and nature, but of the people who live their lives by the sea. Every object we find on the beach has a story, and by understanding and respecting that, we can honor those who were impacted by the disaster. A wall of water floods Natori City, Japan. Something I find quite beautiful is that on March 10, 2012, school children in Misawa released 3 million baby salmon into the waters of the nearby Oirase River in celebration and remembrance. The next day, fishermen and volunteers in the local community held a clam feed on the anniversary of the disaster. Both these events express a profound forgiveness and love for nature. The sea can be a dangerous, brutal thing, but above all, it is a life giver for the world's people. Let's not dwell on the tragedies, but learn from our mistakes, and appreciate the small miracles that it gives us each day. Note: If you'd like to learn more about the town of Misawa, they have a very nice webpage in English for the military folks. Check it out for photos and community information.